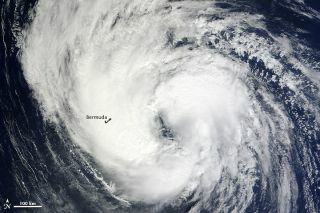 A NASA satellite caught this image of Tropical Storm Leslie as it passed over Bermuda on Sept. 9, 2012. NASA's Terra satellite captured a stunning shot of Tropical Storm Leslie as it moved over Bermuda out in the Atlantic Ocean yesterday (Sept. 9). As the center of the storm passed to the east of the island, Leslie had maximum sustained winds of 60 mph (95 kph), making it a strong tropical storm. The storm's winds have held at this speed today. While Leslie was slow-moving for much of last week, even stalling out at points, it will begin to move faster as it moves farther northward. It is currently headed on a northeast-ward track that has it impacting Newfoundland then moving on to the east of Greenland. There is a hurricane watch and tropical storm warnings in effect for parts of Newfoundland. Leslie is expected to move over the Canadian island on Tuesday morning. By this time it is expected to have become an extratropical cyclone — one that has both moved poleward and shifted its source of energy. Leslie is still generating ocean swells in Bermuda and along the East Coast of the United States, which can cause dangerous surf and rip tides, the latest update from the U.S. National Hurricane Center warned. Leslie was a hurricane earlier in its life cycle, the sixth of the 2012 Atlantic hurricane season. Hurricane Michael is still swirling far out over the Atlantic Ocean as a Category 1 storm with maximum winds of 80 mph (130 kph). Michael is expected to weaken and could become a tropical storm later tonight. Forecasters are also watching another area of disturbance in the atmosphere over the Atlantic that has a 90 percent chance of becoming the 14th tropical depression of the season. If it becomes a tropical storm, it will be named Nadine. The National Oceanic and Atmospheric Administration has said the 2012 season will likely have between 12 and 17 named storms, of which forecasters expect five to eight will become hurricanes. This story was provided by SPACE.com, a sister site to OurAmazingPlanet.